I am a skeptic by nature. I love the idea of holistic medicine and natural remedies, but I am doubtful. When K-Dub starting cutting his four top teeth all at one time, I was ready to try anything. I didn’t like numbing his mouth constantly with gels or giving him Acetaminophen around the clock. He was desperate. We were desperate! In my desperation to find something, anything that would help with his teething pain I contacted the wonderful ladies at Inspired By Finn. They were gracious enough to let me review one of their teething necklaces. I chose the 11½ – 12½” Raw Amber Light Mixture. 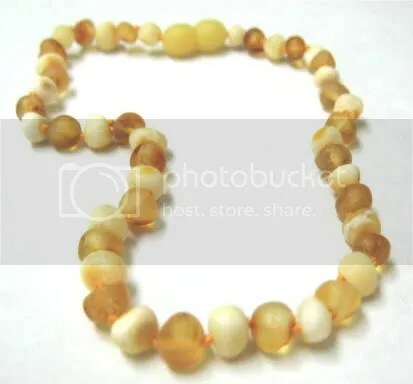 From Inspired By Finn’s Website: “Historically, Baltic amber has been used in Europe as a natural and traditional remedy and curative for many ailments. Long ago it was considered one of the leading medicines of its time. Baltic amber is the most esteemed amber in the world, and the healing qualities of Baltic amber make it unlike any other type of amber found in the world. When Baltic amber is worn on the skin, the skin’s warmth releases trace amounts of healing oils from the amber. These oils contain succinic acid and are absorbed into the skin. What does this have to do with teething pain? Baltic amber contains analgesic properties that helps take the edge off of many types of discomforts associated with dental issues, headaches, joint pain, etc. It also helps with inflammation. During our testing period of four weeks, K-Dub has cut two teeth. For a few days while the tooth was actually cutting through the gums I noticed less drooling, a better appetite, and he was generally less cranky while wearing the necklace. I did not test this necklace at night because I wasn’t comfortable with putting K-Dub to bed with a necklace on. I know that a lot of people leave them on 24/7 or wrap it around the baby’s ankle for bedtime, but I chose not to. So, based on my observations, I would say that it does seem to take the edge off of the pain. It doesn’t appear to eliminate it completely, but Inspired By Finn doesn’t claim that it will. Do I endorse the necklaces? Based on my experience, yes I do. It may not work for every baby, not everything does, but what have you got to lose? Even if it doesn’t work as well for you, you still have a very cute, high quality piece of jewelry for your baby! I was not compensated for this review, but I did receive a teething necklace at 75% off the retail price to facilitate this review. The experiences and opinions are all my own. >Foodie Friday: Pumpkin Whoopie Pies!